Ok this may not be a typical response to getting a parasite, but I promise you this is not looking on the bright side gone mad, nor have I completely taken leave of my senses. This is not a typical parasite. 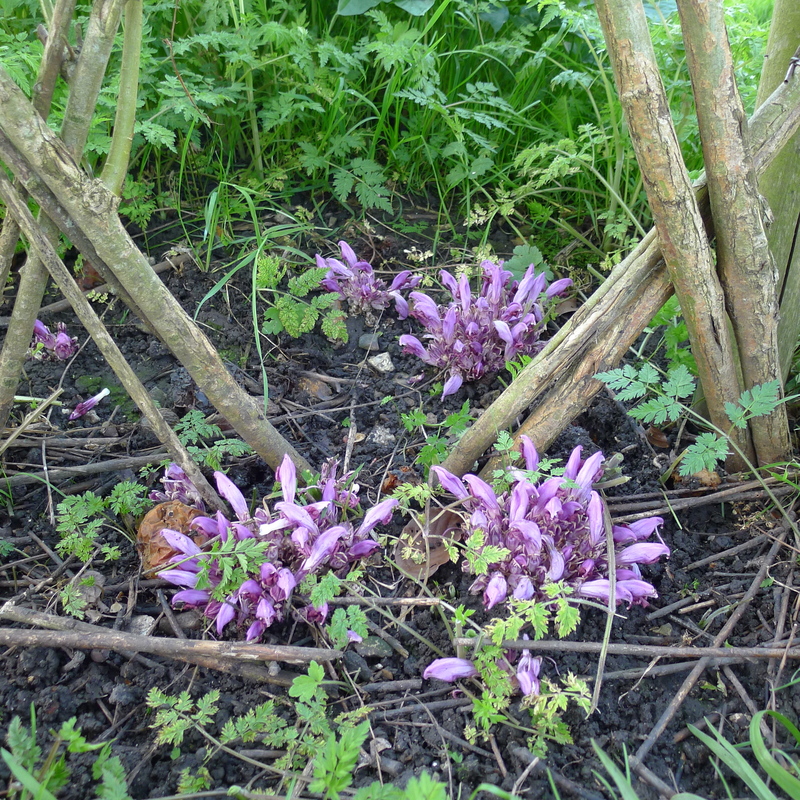 It is the attractive, unusual and perhaps slightly sinister looking purple toothwort Lathraea Clandestina, and technically I don’t have the parasite, the willow “fedge” (fence / hedge) around the tree-house does. I have been trying to establish this little treasure in my garden for eight years, for seven of which I have had no visible success. I don’t believe that has had anything to do with the quality of my supply, which comes from that excellent bulb merchant Avon Bulbs* , but rather the fact that I can be a bit of a chaotic gardener, getting bulbs and plants in (with help) approximately “whenever I get around to it”, rather than straight away, or even that month. This is not a great strategy really. I get away with it more often than I deserve. However, when dealing with the little purple parasite it has been my undoing, as the toothwort needs to stay moist and be dealt with immediately. This year ** however my gardening guardian angel must have been flying low, or perhaps it was the biblically wet winter we endured, but whatever it was I am hugely grateful, and frankly chuffed to pieces. It’s growing! It likes me! All in all it’s shaping up to be a fine spring. There were far fewer fatalities form the wet than I feared, the tulips (Avon Bulbs again, Ballerina, Jan Reus and Abu Hassan) are flowering, the cherries are going for it, the surviving euphorbias – about a third of them – are acid-absinthe perfection, and all in all everything is coming up primroses. * I am a bit smitten by Avon Bulbs. When their catalogue arrives I really get toe-curlingly excited, and it is my favourite bath time read. I realise that I probably need to get out more, a lot more. As a good friend of mine once said “I was going to get a life, but an X-Box was cheaper and a lot less hassle.” Not that I have an X-Box, nor anything similar; just a bad kakuro habit on the tablet, and a strange obsession with certain plant nursery catalogues. But I digress. ** At least I think it was this year. This year I have its flowers, but how long has it been merrily working away below ground getting ready for this moment? I don’t know enough to say emphatically that the success was from last autumn’s planting.